If I didn’t know better, I’d say BrewDog brewed this pair of Christmas beers with the idea of one being for the northern hemisphere and the other for the southern. Jeez, what am I talking about? I actually DON’T know better. In fact, for all I know that is exactly what they were doing. Damn, one paragraph in and this blog post has already gone to crap. 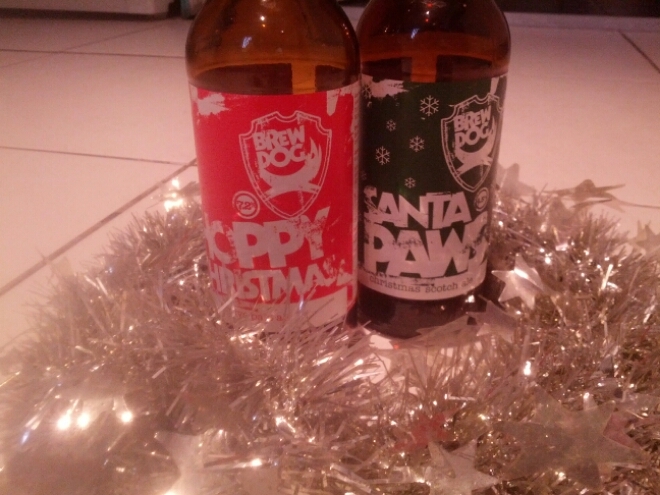 Anyway, the Christmas beers are a scotch ale called Santa Paws and a US IPA called Hoppy Christmas. Yes, it says ‘‘festive pale ale’’ on the label, but this BrewDog wankfartery about creating their own made-up styles really annoys me. So it’s a US IPA – because that’s what it is. Festive pale ale, my arse. Anyway, it’s Santa Paws which is the northern hemisphere beer, because only a crazy person would drink a scotch ale during summertime. And that includes this one which, at 4.5 per cent is lacking some body and comes across as a bit thin. It’s a beer brewed with Scottish heather honey, but I couldn’t find any – a fact which is most likely because I don’t know what that tastes like. In terms of flavour it’s dark chocolate with some coffee sliding down the back of your throat. That part of it’s okay but the thinness in the body turned me against this one. Much better is the southern hemisphere beer, the Hoppy Christmas. At 7.2 per cent it’s going to have enough body – but it might be advised to avoid drinking too many of them on a hot summer’s day. No-one likes a drunk but a summer drunk is the worst kind (why? Because it’s warm so they can go be drunk outside and annoy everyone, rather than the winter drunk where they stay inside cause it’s too cold to go out and piss people off). Anyway, the Hoppy Christmas gives the gift of some delicious sweet fruit bowl aromas, with some pine-resin notes hanging around up the back. Those characters flip around when you drink it, with the pine becoming dominant while the fruit takes a back seat. It all ends with a slight alcohol burn to remind you that it’s a 7.2 per cent beer. I definitely think I’ll be buying some more of this before Christmas comes. BONUS POINTLESS STORY I COULDN’T FIT IN ANYWHERE ELSE: I bought a four-pack of each of these and took one bottle out of each to take a pic for Twitter. Before taking the pic I moved the remainder of both four-packs to the side, which caused a bottle to fall out of one of them and smash on the floor. And send shards far further than you would expect from a bottle falling from ground level. Which beer was it? The Hoppy Christmas of course. Yeah, all four of the scotch ale, which I liked less, emerged unscathed, but the one I like? Well, that has to smash. I have had a hoppy christmas but it was from the previous year so it was a pale imitation of what it should have been. I will look forward to trying the santa paws when it comes in which will be soon no doubt.